The second part to our mini series on the Gantt chart (click here for part 1) deals with the advantages and the disadvantages of bar charts and clever ways to use them. The Gantt chart is one of the best tools to keep an overview of the duration and succession of processes and milestones within a project. Moreover, with the Gantt chart you can see existing dependencies between processes at a glance. Project management software automatically calculates a project plan according to the parameters defined by the project manager. Time restrictions and dependencies are automatically taken into account. The project plan is calculated based on the underlying work time calendar - working hours and non-working hours are automatically factored in the calculation of process duration and the overall project completion. At request, slack time and the critical path can be displayed as well. This way project managers can always see how much time they have left until the scheduled project completion, where it might be necessary to increase manpower and where to cut down on workload. 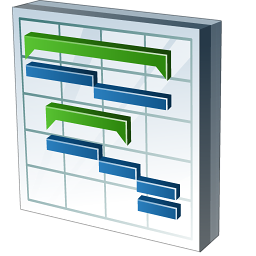 Software-aided Gantt charts can be easily expanded. Specific tasks can be assigned through work packages, clarifying responsibilities for a variety of processes. Some tools allow for a comparison of forward and backwards planning, making it easy to identify critical milestones. The project plan can be effortlessly updated: When moving an activity in the time plan, all connected activities are moved accordingly. Difficulties arise when the Gantt chart is not used correctly. A Gantt chart should simplify managing projects by providing a comprehensive project overview. However, if meetings are solely used to update the chart, something is amiss. The greates challenge is the level of detail to be reflected in a Gantt charts. If every minute detail is included the chart gets confusing and loses its information value. When working on bigger projects, it makes good sense to create individual Gantt charts for part projects. Agile methods can easily be combined with the Gantt chart tool, e.g. a Gantt chart could be created for each sprint. Critic of Gantt charts find fault with the fact that the activity progress in a Gantt chart does not reflect the overall project success. A 50 percent time completion does not indicate an equivalent activity progress. In order to reflect such information, interim results should be included in the project plan as milestones. This way, it is easy to keep track of deadlines and monitor whether interim results were met. Project software allows you to create Gantt charts that show the progress of individual activities, making the Gantt chart one of the most important tools for project controlling. Many project planers who shy away from investing in project management software use Microsoft Excel to create Gantt charts. You can create a Gantt chart when stacking the individual bars in a bar chart. In preparation for the Gantt chart, you create a table of the various activities including their start- and finish day as well as the time remaining in days. The horizontal axis of the chart is labeled with the time units in days. The final step is to make sure that the bars are hovering without being attached to the vertical axis. This is done by formatting the first bar row without filling and frame. Gantt charts created with Excel fulfill its basic functions. When making changes to one activity, you have to manually change all the following activities. Additional functions such as assigning work packages or automatic calculation of project duration based on restrictions and dependencies are not available in Excel. Gantt charts created in Excel are absolutely sufficient for simple projects such as planning a party or setting a time frame for a research paper. When it comes to professional management of more complex projects, creating Gantt charts with Excel might not be your best option. The Gantt chart – Part 2 - InLoox • Copyright 1999-2019 © InLoox, Inc. All rights reserved.